It is important to keep all doors in your home functioning properly, and this is where good door repair service is needed. Door repair, especially if it is an emergency door repair or repair of the main entry door, is best done by our company. Call 718-504-7475. It is important to keep all doors in your Business/Store/Factory functioning properly, and this is where good door repair service is needed. 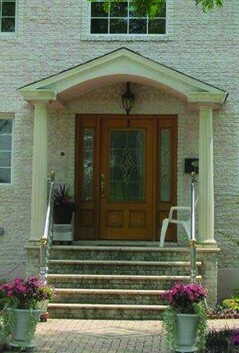 Especially if it is an emergency door repair or repair of the main entry door, is best done by Door Repair Brooklyn. At Door Repair Brooklyn, we install and repair doors throughout all of Brooklyn, including Greenpoint, Williamsburg, Brooklyn Heights, Bedford-Stuyvesant, Bushwick, Highland Park, Park Slope, Crown Heights, Coney Island, and Flatbush. Wherever you are in Brooklyn, you can count on us to get to your location quickly, so that you can get back to your daily life. Besides our efficient response time, we pride ourselves on offering a wide range of doors for you to choose from. Door Repair Brooklyn provides service for many types of doors, including aluminum doors, glass doors, frameless doors, fireproof doors, revolving doors, as well as door closers. We offer commercial door repair, services for both interior doors and exterior doors, as well as brownstone door repair. All of our technicians have at least five years of experience in door repair and installation, and they are courteous professionals who work efficiently to make sure you can get back on track in no time. Furthermore, out prices are extremely competitive, and we offer service 24 hours a day, 7 days a week. What’s more, we guarantee that any emergency will be attended to within one hour. Give us a call today! Call Door Repair Brooklyn today to (718) 504-7475! Major doors and gates repairs for all leading brands. Repair and replacement of door’s parts. Replacing storefront glass door locks. Residential Doors Repair Specialist Our service professionals are experts in door repair and replacement, and are committed to ensuring your needs are met quickly and efficiently. Installation and servicing of locks and other door hardware. Quality locks for your home. Emergency lockout and lock change services. Commercial storefront glass door installation and repair. Find low prices on aluminum glass storefront doors for commercial buildings. We offer a wide range of services to help business owners in the Brooklyn, NY Metro area. From 24H emergency glass door repair to a complete new storefront and glass installation, we offer commercial hardware repair and replacement . Are you in need of door repair to be done in your home? Hire Door Repair Brooklyn, New York that specializes in installing, repairing and servicing doors, locks, access control systems and more. From fixing a Dead Bolts to fix a door that won’t close, we do it all. For residential costumers we repair and install exterior and interior doors of every shape and size. Our professional handyman services increase your home’s efficiency by replacing or repairing cracked or broken interior and exterior doors. For commercial costumers we repair and install all type of doors, we are a full service install and repair company, offering trusted and reliable general contracting services in doors of all types. Our goal is the complete satisfaction of our customers, and we will build, and repair anything in order to realize your need of a perfectly functioning door. Specializing in installation, service, and repair Door Repair Brooklyn offer a wide variety of doors and security products for your home, business or commercial building. Residential services include free on-site and over-the-phone estimates for new installations and renovations, 24 hour emergency service, regular tune-up maintenance, repair services, and parts sales for the do-it-yourselfer. Door Repair Brooklyn has access to parts for all your major name brand doors and openers. We also provide replacement sections for damaged doors, weatherstripping for energy efficiency, and a knowledgable staff always answer all your questions. Door Repair Brooklyn is the place to go for all your commercial needs! We install and service all major brands and types of doors including overhead doors, loading docks, rolling gates and grilles, gate operators for motor vehicle entry, handicap accessible doors and controls, commercial entry and fire rated doors and controls, storefront doors and windows, and more! Our experienced professional staff offers sales, project management, field management, fabrication and warehouse operations. Getting you what you need on time and at the right price is our commitment to you. Whether you need one door or large projects, we will make sure you have the products and service to get your project completed. 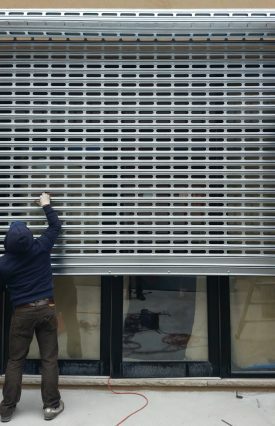 We service and install the following types of doors such as: storefront doors, hollow metal doors, automatic doors, wooden doors, glass doors, fire doors, warehouse doors, frameless glass doors, security grilles, sliding mall doors, sectional roll-up doors, rolling steel doors, overhead doors, drive-up windows, and revolving doors. No matter how good our products are, they cannot work correctly with improper installation. For this reason, our employees are trained and experienced in all storefront gate and doors repair services such as pivots, door hinges, door closers, glass doors, motors, springs, key switches, commercial aluminum doors, commercial door closer, commercial door hardware, commercial door lock, commercial entry door, commercial glass door, commercial steel door. Our first one priority is your utmost satisfaction! Let us demonstrate to you our comprehensive knowledge of products. Call us to get the job done in a timely fashion and with quality that won’t break the bank. Our business is based upon the high level of service we are able to provide our customers.